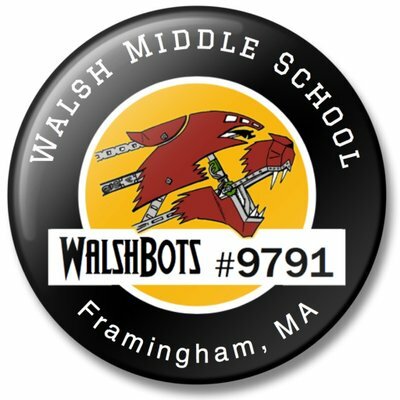 January 18, 2019 (Framingham, MA): This weekend 23 middle school robotics teams from Billerica, Framingham, Leominster, Lexington, Marlboro, Milton, and North Andover will be competing all day in the VEX Robotics Competition game ‘Turning Point’. Teams will compete in qualifying rounds to establish performance rankings and will be evaluated by judges on their engineering design process, build quality, as well as their performance on and off the field. This tournament will qualify the winners of the competition and judged awards, to move up to Southern New England Regional Championships which take place February 23rd at the middle school level. Regional Championship winners will move up to compete in the VEX Robotics World Championships which takes place April 24th - 28th in Louisville, KY alongside over 750 middle and high school teams from 45 countries. Framingham Public Schools will be fielding four middle school teams from Cameron and Walsh Middle Schools. Students have been designing, building, programming, and testing their robots ever since the game was revealed last April. Students are part of 4-6 member teams. As part of the Framingham Public Schools after school program, students meet multiple times a week to work on their robot. Teams can also bring the robots home to perfect their build and programming. The Framingham Middle School Qualifier is one of a series of VEX Robotics Competitions taking place internationally throughout the year. VEX Competitions are recognized as the largest and fastest growing competitive robotics programs for elementary schools, middle schools, high schools and college aged students around the world. VEX Competitions represent over 20,000 teams from 45 countries that participate in more than 1,500 VEX Competition events worldwide. The competition season culminates each spring, with VEX Robotics World Championship, a highly-anticipated event that unites top qualifying teams from local, state, regional and international VEX Robotics Competitions to crown World Champions. More information about the VEX Robotics Competition is available at RoboticsEducation.org, RobotEvents.com and VEXRobotics.com. VEX Robotics Competition Turning Point is played on a 12’x12’ square field configured as seen above. Two (2) Alliances – one (1) “red” and one (1) “blue” – composed of two (2) teams each, compete in matches consisting of a fifteen (15) second Autonomous Period followed by one minute and forty-five seconds (1:45) of Driver Controlled Period. Event information: More information on the event and directions can be found on the Robot Events website. The event is open to the public and there is no admission fee.